EURUSD has been choppy although there were no major economic reports. Today the ECB President Draghi’s speech may empower EUR. 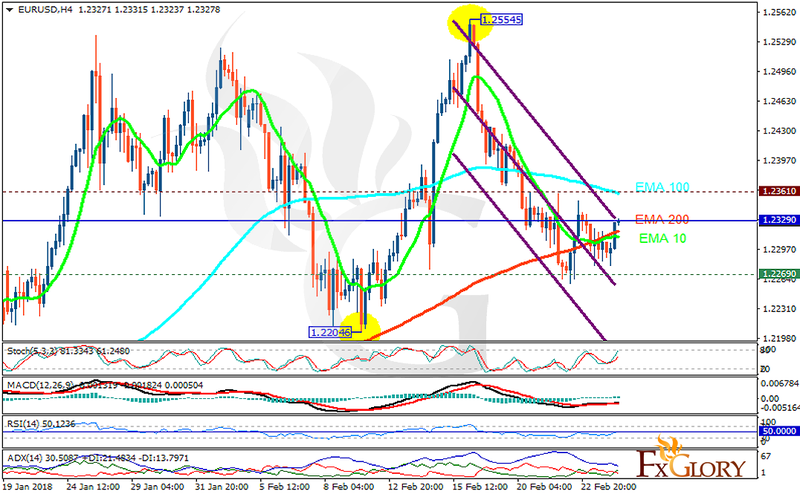 The support rests at 1.22690 with resistance at 1.23610 which the weekly pivot point at 1.23290 is located in between the lines. The EMA of 10 is moving horizontally in the descendant channel and it is below the EMA of 200 and the EMA of 100. The RSI is rising towards the 50 level, the Stochastic is showing upward momentum and the MACD line is above the signal line in the positive territory. The ADX is showing buy signal. Long positions are recommended 1.24.